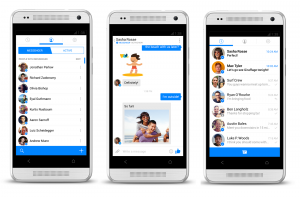 Messenger Facebook has a completely new face. The new update of this messenger service offers a new experience in the instant messaging software applications. This version is more similar to other instant messaging services like WhatsApp or Line. Facebook wanted to be a real competitor with these other well-known services by offering some special features. The most exciting innovation is the possibility to see if a friend is connected at any time. Facebook Messenger includes a small Messenger icon next to the avatar of this person and it shows if he is connected through Messenger app or he is using Facebook Chat on the web. With this information, we will know if the person we are chatting with is going to receive our messages instantly. This feature makes a distinction between Facebook and Messenger Facebook. In fact, the real name of this application is just “Messenger”, the word “Facebook” has disappeared. It shows the intention of the company to make clear that they are two different services. In this sense, Messenger has also the possibility to add contacts from their phone number, without adding them to our Facebook friend list. This functionality allows the open the communications to anybody, regarding they are our “Facebook friends” or not. The look of Messenger application is typical Android, with a new light and energetic blue tonality for the icons, text and buttons. Messenger is clearly moving from Facebook shadow to find its own place among instant messenger services. In its newsroom, Facebook announced that the application is now available to a limited number of Android users today, and it will reach everyone on iOS and Android in a few weeks. If you want to give it a try, you can download the app from the Google Store. Just remember to uninstall first the older version, if you already had one.